The North West’s biggest arts, craft and design market returns on Saturday 2 June 2018. 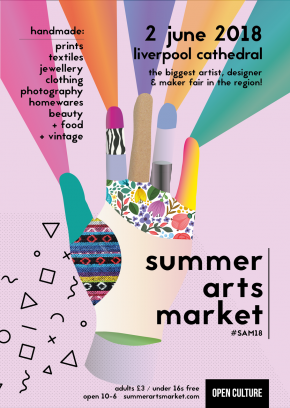 Kicking off the summer slightly earlier than in previous years, the Summer Arts Market will once again take over Liverpool Cathedral with over 200 stalls from some of the region’s best artists, designers and makers. The Summer Arts Market will feature the creative work of some of the region’s best artists, designers and makers selling handmade work and original designs directly to the public. Thousands of items will be exhibited and on sale – everything from photography, ceramics and jewellery to screen-prints, decorations, cards, clothing, photography, woodwork, glassware, textiles and handmade beauty products. Downstairs in the Cathedral’s Concert Room, a pop-up vintage fair will offer a range of vintage clothing, jewellery, handbags, homewares and vinyl. Along the corridor in the dedicated food fair, local artisan food producers are on hand with delicious food and drink including chocolate, liqueurs, tea, jams, cake and much more. Steve Threlfall of Urban Workbench creates high quality furniture from modest materials, aimed at producing a product that is both affordable and aspirational. Products from retail sales help fund a making and consultation learning programme and tackle issues of furniture poverty in the region. FELL x DEBENE are presenting their unique ceramic jewellery range; sculpted by ceramicist Malena de Bene and glazed by artist Ria Fell, each piece is made locally and centres around modern, minimalist design. Judy Musselle trained as an illustrator and printmaker and has had a successful career in greeting card, book and magazine illustration. her work is concerned with storytelling; reflecting her dreams and childhood memories and inspired by traditional folktales. Jan Hirst and Dan Forster aka Lost Fox combine contemporary illustration – bold geometric forms and simplified line-work – with the traditional craft of screen printing. Their designs are inspired by their passions and experiences outside of work life – messing about in the great outdoors, riding waves and discovering new places. Max McDonough of Rawhide Custom crafts leather wares using only the finest British vegetable-tanned leather, and solid brass hardware. Items are crafted using traditional techniques, without any sewing machines or industrial cutters. Peckish shoppers will be able to grab a bite from the Cathedral’s Welsford Café, open all day serving a BBQ and other refreshments. The Summer Arts Market is organised by Liverpool social enterprise Open Culture, who have staged the event annually since 2013. The market aims to provide the public with a chance to purchase affordable, unique work directly from artists and makers; helping to support independent businesses in the creative economy and keeping money local. Open Culture also organise seasonal sister event the Winter Arts Market which takes place on 1 December 2018.